Another fine production from the Northern Electronics camp. Heading to the hallways of hypnosis, suburban Stockholm artist Fabian Kempe makes the vinyl debut with “Path 0102.591”. Korridor’s mini-LP is focused on acid-tinged atmospheric excursions reminiscent of the works of fellow countryman Andreas Tilliander (TM404) and the label’s own Ulwhednar. Preferring the subtleties, Korridor’s composition of “Path #01” prefers fuzzy surface with background crackles. The best pick is viciously looping “Path #02.5”, which reminds of Mike Dred’s “Macrocosm” while “Shift #91” moves closer to the section of aquatic ambient. 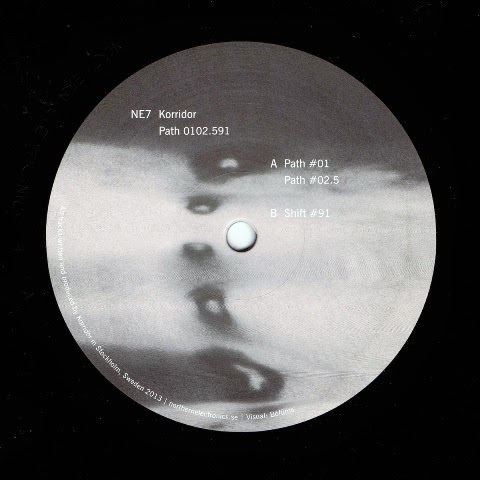 All in all Korridor’s work can be seen as a likable attempt to redefine the dub techno.